Summer is really here now. I know because it’s Wimbledon and it’s my birthday in a few days’ time. But not only that, it’s actually very warm and has been for a while. It’s important to remain hydrated in hot weather and having a few delicious drink recipes on hand helps. 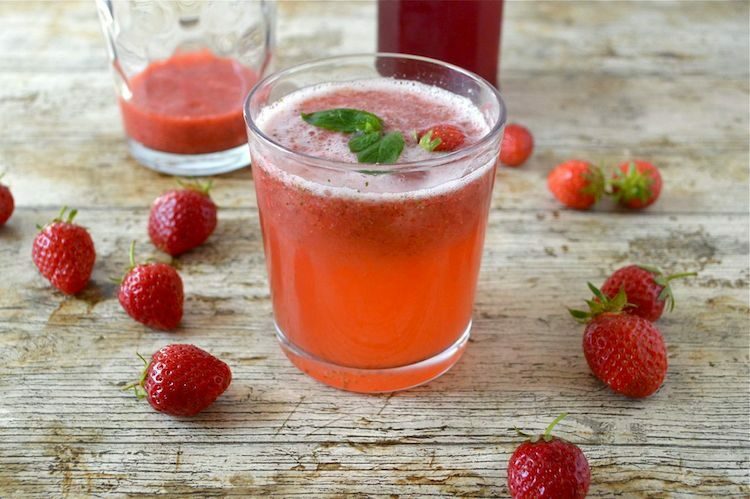 This strawberry rose mint fizz cooler recipe is ideal for the occasion. When I’m really hot, I like to drink something that is sightly tart. I find a drop of apple cider vinegar in a glass of water works really well. More recently I’ve been using my kombucha vinegar to the same effect. It’s always nice to ring the changes though and to have something special on hand for guests or visitors. When I saw this post for raspberry and mint frosé over at Feeding Boys, it made me so thirsty, I immediately rushed off to create this strawberry rose mint fizz cooler. My strawberry rose mint fizz isn’t alcoholic. Everyone, including children can drink this in complete confidence. However, if the desire is there, a slug of gin would make a very nice addition. It’s simple and quick to make and very refreshing. The strawberry hit is as good as a Wimbledon grand slam – it’s delightful with subtle undertones of fragrant rose, fresh mint and cooling ice. I’m just glad it’s not me on Centre Court. I make my own rose syrup. It’s very easy if you have access to unsprayed deep scented roses. I used my fabulous Optimum G2.3 induction blender which blitzed the strawberries, mint and ice in seconds. If you’d like to order any Froothie appliance including the G2.3 blender, I can offer Tin and Thyme readers free P&P. Just add 2483 free ambassador delivery to the comment box when ordering. Delivery will be credited back onto your card. As I go to press all orders over £200 come with a free nutriforce extractor. An easy to make refreshing summer non-alcoholic drink. Packed full of strawberries and sweetly scented with rose and mint. Place all but 4 strawberries into a power blender. I used my Froothie Optimum G2.3. Add the large sprig of mint, the syrup and ice cubes. Divide between 4 tall glasses or tumblers, then top up with fizzy water. Half the remaining strawberries and add two halves to each glass with a sprig of mint. Add a slug or two of gin for a special occasion. 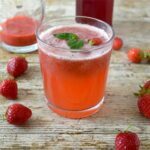 I’m sharing the strawberry rose mint fizz cooler recipe with Simple and in Season over at Feeding Boys. Strawberry Rose Mint Fizz Coller. PIN IT. This post contains affiliate links. Buying through a link will not cost you any more, but I will get a small commission. I was not expected to write a positive review and all opinions are, as always, my own. Thanks to my readers for supporting the brands and organisations that help to keep Tin and Thyme blythe and blogging. Vodka sounds like a mighty fine idea Dom. I might just join you. It is that Angie and very quite delicious too. That sounds fantastic Jenny. I’ve used whey for lacto-fermenting, but I’ve not tried it for fruit drinks. Do you sweeten it with anything? happy birthday – I think this drink would be a lovely birthday drink – perfect for sitting out in the garden and enjoying the sunshine (hope there is sunshine). We are so into our lemonade that we make it quite often – I think I should try strawberries in it when summer is here again – though I am not sure I will have rose syrup but perhaps rosewater. Ah yes homemade lemonade. That’s possibly the best summer drink ever. It’s always good to have a bit of variety I find and rose and strawberry go very nicely together. The weather is so hot right now, I think I could drink a gallon of this. What a lovely recipe. Thank you Jane. It’s just perfect for summer. We have an abundance of strawberries and mint right now. Did you make this recipe for me 😀 It looks fab! What a wonderful picture that “an abundance of strawberries” conjures up. I’m not envious really! Let me know if you make it. Wow, what a beautiful looking drink. I must make some rose syrup before the blooms go! I love this! So refreshing and summery. Thanks Kate. It’s just what’s needed for sipping in the garden on a hot summer’s day. Thanks Kate. It really does help in hot weather. I think it’s coming back! Strawberry is my number one summer flavour bar none! I think I’m with you on that Cathy.